Interstate 190 is the spur of Interstate 90 that leads from the New York Thruway mainline north to Downtown Buffalo, Grand Island and Niagara Falls. This is one of two three-digit Interstate highways to end at an international boundary. The other is Interstate 110 in El Paso, Texas, which links I-10 with the Bridge of the Americas into Ciudad Juarez, Mexico. Erie County Clerk David J. Swarts presented a petition of about 20,000 signatures to regional transportation officials advocating the removal of the Interstate 190 toll plazas within the city of Buffalo. The contention was that Buffalo is the only upstate city in New York that had tolls levied on its commuters. 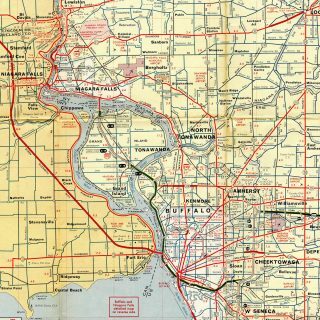 He cited the differences between Buffalo and Rochester as a justification for the toll removal. 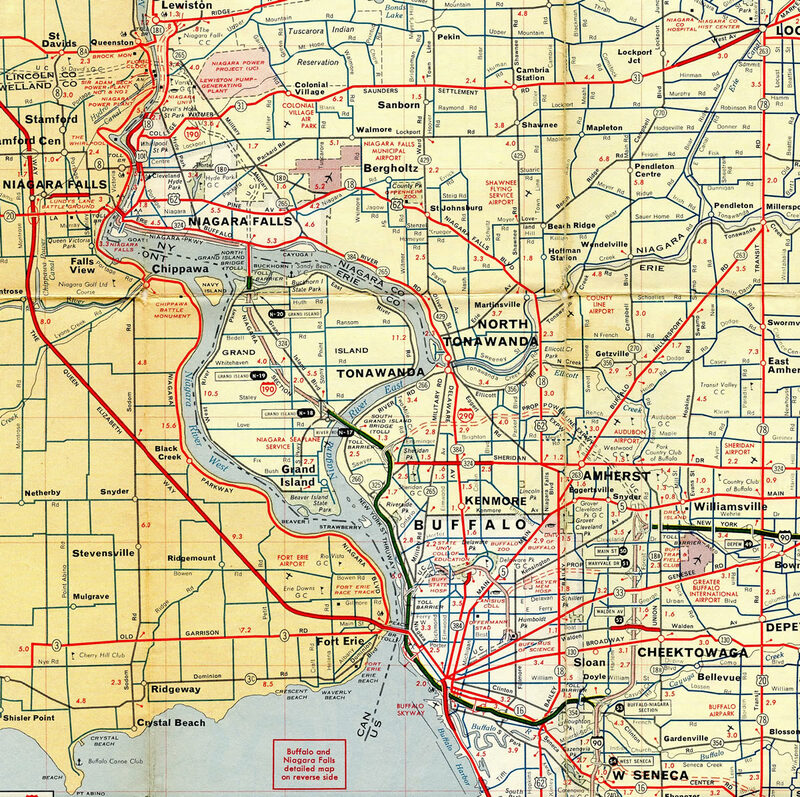 The Niagara Section of the Thruway initially extended northwest from Buffalo to Grand Island and New York 384 (Buffalo Avenue) in Niagara Falls. Interstate 190 curves northwest through a three quarter cloverleaf interchange preceding the customs station for the Lewiston-Queenston Bridge into Ontario, Canada. Exit 25A departs for parallel New York 265 (Military Road), a north-south route between Niagara Falls and Lewiston. Photo taken by Douglas Kerr (05/06/02). Exit 25B represents the last departure point ahead of the port of entry for Ontario 405 and Saint Catherines on I-190 northbound. A loop ramp joins Upper Mountain Road west ahead of ramps for New York 104 (Lewiston Road) and Niagara Scenic Parkway. Photo taken 05/27/00. The last mainline off-ramp from I-190 connects with South Ogden Street. The southbound freeway maintains three lanes to Interstate 90 (New York Thruway). Photo taken by Chris Elbert (07/06). A second diagrammatic sign precedes the separation of Interstate 190 south into the ramps for I-90 west to Erie, Pennsylvania and east to Buffalo Niagara International Airport (BUF). Photo taken by Chris Elbert (07/06). The Niagara Section of the New York State Thruway comes to an end. Although still a part of the Thruway mainline, I-90 through Buffalo is toll free between Interstate 290 (Exit 50) and U.S. 219 (Exit 55) to the south. Photo taken by Chris Elbert (07/06). Exit 52A leaves I-90 (New York Thruway) west for William Street, 1.5 miles ahead of the south end of Interstate 190 (Niagara Section of the New York Thruway). Interstate 190 encircles Downtown Buffalo to the west, connecting the city with Niagara Falls and the Lewiston-Queenston Bridge to Ontario Provincial Route 405. Photo taken by Jeff Morrison (07/01/07). Interstate 190 branches west from I-90 in a half mile to Downtown Buffalo and the Rainbow Bridge into Fort Erie, Ontario. Photo taken by Jeff Morrison (07/01/07). Westbound Interstate 90 (New York Thruway) reaches Exit 51, Interstate 190 (Niagara Section of the New York Thruway). The westbound Thruway continues with three lanes toward toward Erie, Pennsylvania, and Cleveland, Ohio. Photo taken by Jeff Morrison (07/01/07). A directional T interchange joins Interstate 90 with I-190 north. The succeeding Thruway exit connects with New York 400 (Aurora Expressway). Photo taken 05/27/00. Passing through the three-level interchange with Interstate 190 on I-90 (New York Thruway) eastbound. Four additional exits link the toll free portion of the Thruway with the Buffalo area. Photo taken by Douglas Kerr (10/19/02). “Petition supports case for removing toll barriers.” Buffalo News, November 11, 2003. Cuff, Richard. “Thruway Exit Numbering (was: Re: [northeastroads] Re: Who else out there hates I-99).” Online posting, Yahoo! Groups Northeastern U.S. Roads, November 20, 2003. Interstate 190 (New York) @ Wikipedia.org. Page updated May 27, 2009.